Do You Agree With New York's Favorite Jelly Bean Flavor? Jelly Belly has really brought a broad spectrum to the jelly beans flavors. Flavors have gone from red, green and purple to dish soap, roses and pot roast. It's crazy. This also makes it harder to try and figure out what exactly is the best flavor of jelly bean! "New York is the epicenter of U.S. entertainment. Between Broadway, professional sports teams, Woodstock, and more it has a rich history of keeping people occupied. That’s why it’s so fitting that New Yorkers love buttered popcorn jelly beans—a perfect snack to enjoy while spectating." Do you buy this? Is popcorn that influential in the state that we even enjoy it in candy form? The runner-up was cherry followed by bubble gum. So popcorn, cherry and bubble gum. Seems like a pretty versatile list, looks like New York has a pretty diverse palette! How did the United States feel about jell bean flavors? Topping the list was black licorice. Another shocker! 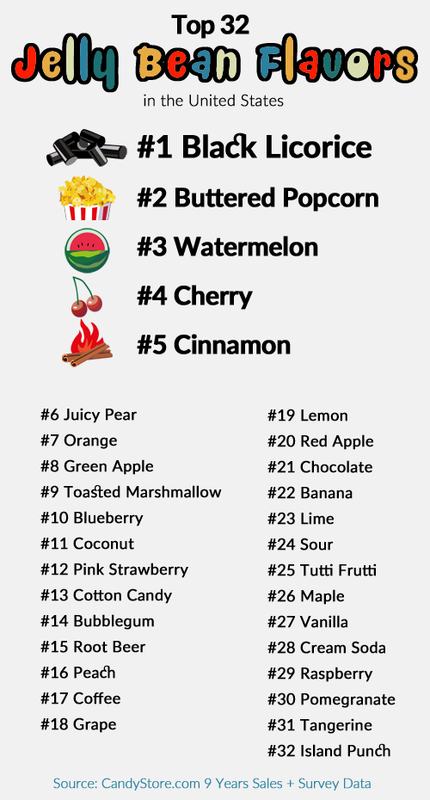 You can check out the full list of what the top flavors are in each state HERE and purchase a made amount a popcorn flavored jelly beans HERE. No matter what your favorite jelly bean flavor is it's always nice to eat them when the Easter Bunny drops them off! Happy Easter! Source: Do You Agree With New York’s Favorite Jelly Bean Flavor?